The assassination of President Kennedy in 1963 continues to be shrouded in mystery and controversy. 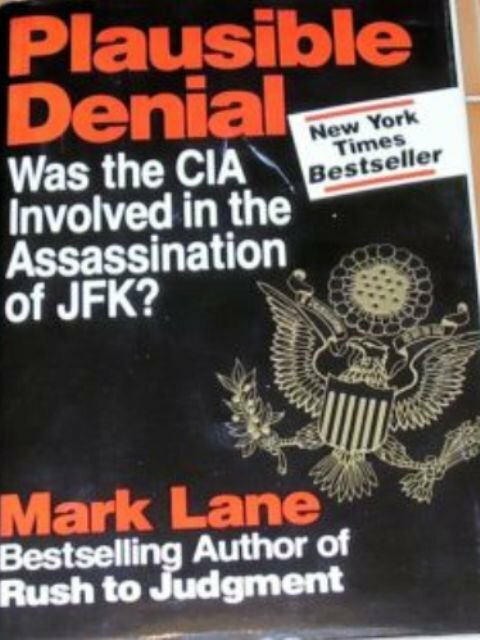 In Plausible Denial, Mark Lane, the author of Rush to Judgment, the provocative and bestselling critique of the Warren Commission, reveals startling evidence about the CIA's involvement in a plot to murder the president. In 1978, when a small magazine ran a story by CIA renegade Victor Marchetti linking ex-CIA operative and convicted Watergate burglar E. Howard Hunt to the assassination, Hunt sued for defamation. Lane signed on as defense counsel for the publication, and set out to prove the truth of the allegations against Hunt and the CIA. Lane's investigation uncovered a web of conspiracy that involved anti-Castro Cubans, Watergate conspirators, and public officials at the highest levels of the intelligence community. The forewoman of the jury, Leslie Armstrong, stated that "Mr. Lane was asking us to do something very difficult. He was asking us to believe that John Kennedy had been killed by our own government. Yet when we examined the evidence, we were compelled to conclude that the CIA had indeed killed President Kennedy." Meticulously documented and compellingly written, this book makes public the contents of this curiously unpublicized trial, the only jury verdict directly related to the theory that the CIA was involved in the assassination.